Political debates sometimes seem a bit like tennis. First Minister’s Questions (FMQs) is a serve and volley game: a question is served, the First Minister returns with as much spin as she can muster and her opponent might get just one chance to volley it back. There’s no time for lengthy baseline rallies to expose each other’s weaknesses, the serve dominates the game. This is why opposition parties who challenge the SNP on why they aren’t raising taxes against the rich make a tactical mistake. The smarter serve would surely be to ask why they don’t reduce taxes for the poor? The SNP now have the powers to do so if they wanted to. The basic rate of income tax chosen by Westminster is 20% and applies to earnings above £11,000. The Scottish Government could help those subjected to in-work poverty by simply lowering the basic rate* and/or raising the amount you need to earn before you pay it. So why don’t they? Of course they’d need to make difficult decisions about how to fund that tax cut, but that’s what a party of government is supposed to do. Maybe they could decide that some higher earners can afford to pay for their prescriptions or their children’s tuition fees, maybe they could have the courage to tax higher earners a bit more. The point is that the debate should start with why the SNP aren’t choosing to do more to help the poor - addressing how that help should be funded is the secondary question, something for later in the rally. But if FMQs and debates in the chamber are serve and volley tennis, Holyrood’s committee rooms are the clay courts. Dominated by long and often tedious baseline rallies, this is where politicians need to be able to show that they can do more than simply block back questions with well-rehearsed replies. 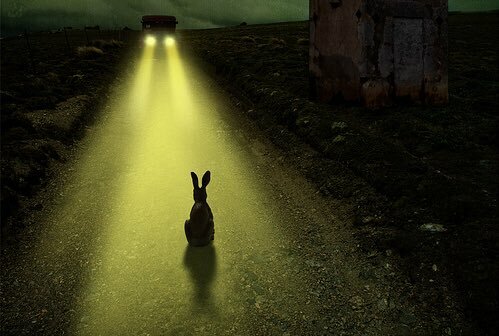 Which brings us to SNP Finance Secretary Derek Mackay’s rabbit-in-the-headlights performance before last week’s Finance and Constitution Committee. Regular readers of this blog will know that - despite SNP rhetoric about “Tory cuts” - the total Scottish budget for 2017-18 shows a whopping £371m real-terms year-on-year increase1. It’s even increased in real terms since the pre-austerity peak of 2009-102, despite North Sea oil revenues having declined by nearly £6bn since then3. Of course this is only possible because we voted against independence and continue to pool and share our resources within the UK. 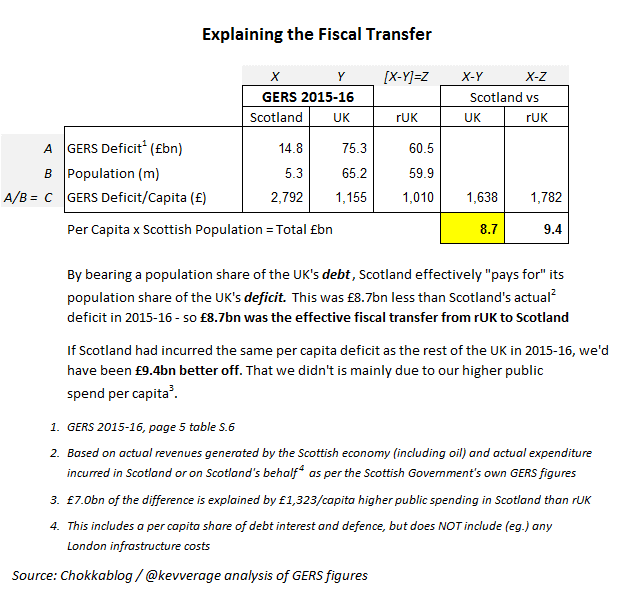 This simple fact bears repeating: taking our fair share of the UK’s costs - as determined by the Scottish Government when compiling the Government Expenditure and Revenue Scotland (GERS) figures - we now effectively get back over £9bn more from Westminster than we send in taxes4. That’s over £1,700 for every man, woman and child in Scotland. So Derek Mackay is a very lucky man. He has more money to spend and more power than any Finance Secretary before him. He could take pressure off the poorest in our society by topping-up benefits and he could address in-work poverty by shifting some of the tax burden onto those with the broadest shoulders. When Tory MSP Murdo Fraser asked Mr Mackay to confirm the growth in the Scottish budget, his response was astonishing. He admitted to the increase this year (how could he not?) but on the longer-term question he kept insisting that there had been a real terms 9.2% reduction. 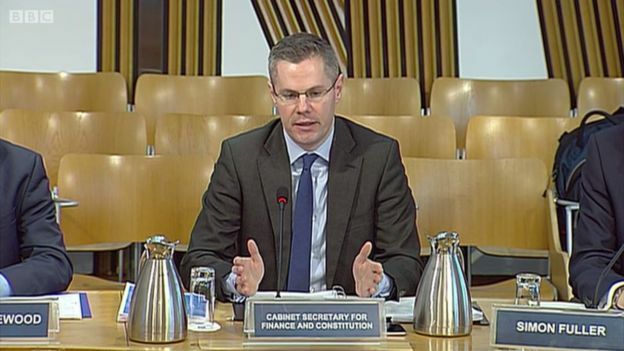 It quickly became embarrassingly clear that Mr Mackay was neither familiar with the various spend categories in the Scottish budget nor with the difference between the actual budget year under discussion and some flaky longer-term forecasts5. Maybe there aren’t many people who understand the differences between the Total Budget and Departmental Expenditure Limits (DEL), non-cash DEL, financial transactions, capital borrowing and Annually Managed Expenditure (AME)6 – but surely we should expect our Finance Secretary to be one of them? Here I confess to feeling some human sympathy for Mr Mackay. He is clearly out of his depth, a man promoted well beyond his ability. That’s not his fault, the responsibility for that must lie with the person who promoted him: my new fellow Daily Record columnist, Nicola Sturgeon. To be fair to our First Minister, it can’t have been easy choosing a Finance Secretary when the talent pool is so shallow. 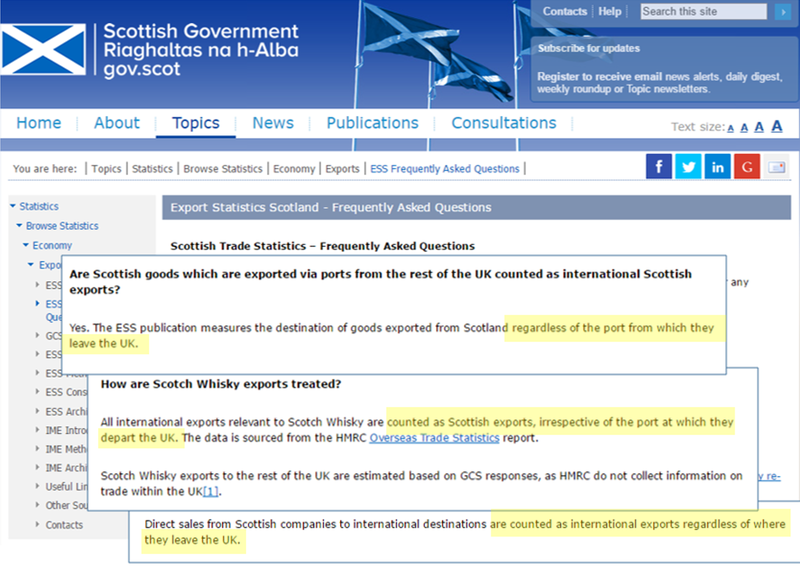 This was illustrated just in the last week, with MSPs Gil Paterson and Sandra White following their colleague Paul Monaghan’s lead by taking to Twitter to advertise their ignorance about how Scottish Export Statistics work7. I started this blog comparing politics with tennis - but tennis is just a game and politics is about real people’s lives. So I hope Ms Sturgeon uses her new platform in the Daily Record to do more than just deflect blame onto Tories, Westminster and Brexit; I hope she shows the Record's readers enough respect to start honestly addressing the economic realities of the choices we face. *It's been rightly pointed out by a reader (see comments below) that the Scottish Government does not in fact have power to change the personal allowance (the limit at which you start paying tax). Whilst this is technically true, they *do* however have the power to create new tax bands, so they could simply introduce a new zero-rated band to effectively increase the personal allowance as I hypothesise - my point still stands. 5. 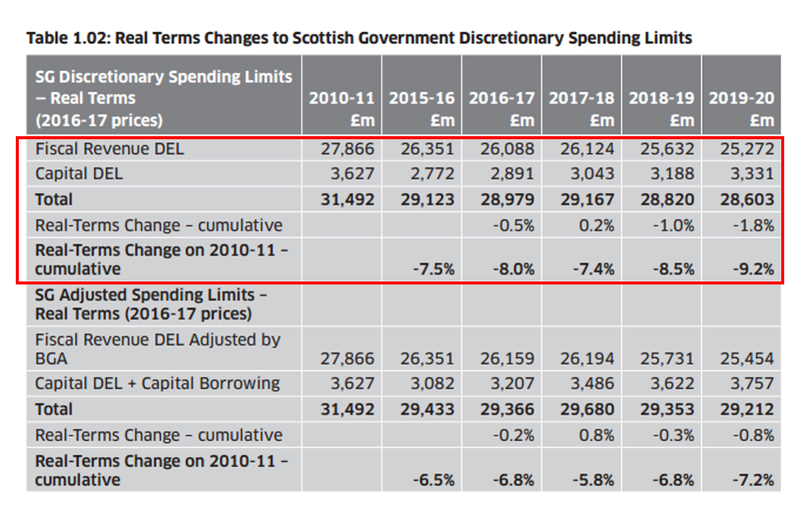 Derek Mackay's "9.2% real-terms decline"
See here: Mackay repeatedly refers to "over a 10 year period a real-terms reduction of 9.2%" and says later "has been reduced" by 9.2%. 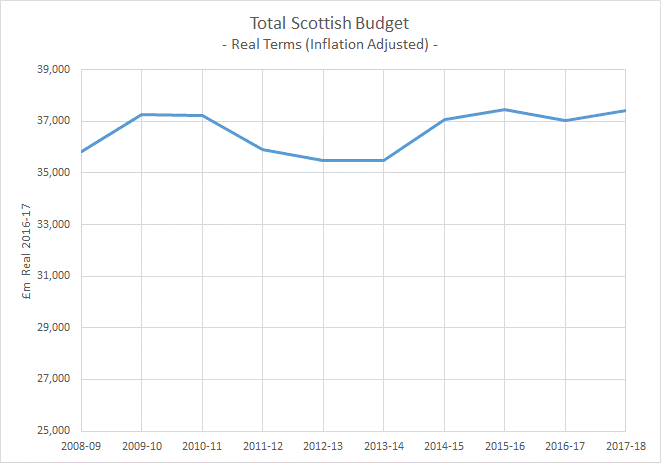 As I explain in the above blog post, this figure is based on a frankly flaky forecast to 2019-20 (so Mackay is simply wrong when he says "has been reduced") and even more importantly this figure excludes critical elements of the Scottish Budget (see note 6. below). This doesn't stop the likes of Gil Paterson and Sandra White spreading memes that suggest the opposite. In both cases - when politely made aware of the misleading nature of what they'd shared they made no effort to correct the misconception. By knowingly perpetuating a lie that helps their argument, these MSPs show total and utter contempt for their followers, for Scottish voters.